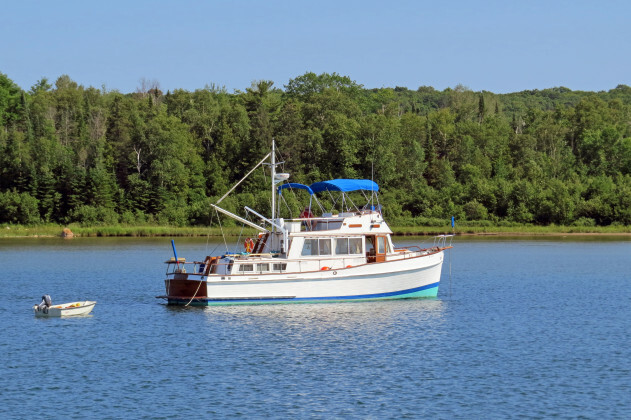 For some cruisers, especially those coming from Sault Ste Marie, northern Lake Huron or Lake Michigan, wilderness cruising in the North Channel starts well west of Beardrop Harbour and the Whalesback Channel. There’s also a variety of ports-of-call in the western reaches of the Channel offering a wide range of services and attractions. Our route took us west and north to the Soo and Lake Superior, then back south and east, past Drummond Island in the U.S., Cockburn Island and Meldrum Bay (at the western end of Manitoulin Island). Cruisers will likely spend more overnights in marinas than on the hook, but the tradeoff comes with welcoming communities and shoreside attractions. 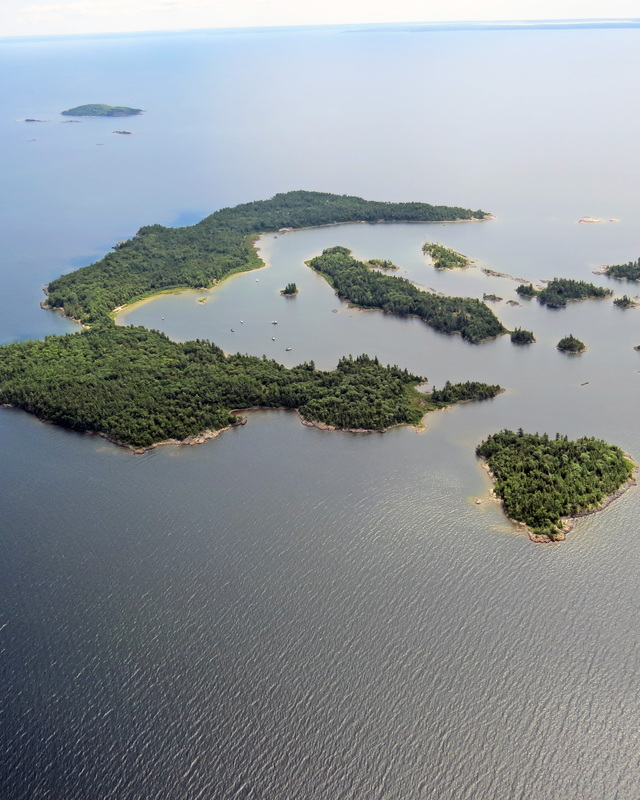 West of the Whalesback, Taschereau Bay is well protected by islets and rocks. In all but strong southwest winds, it offers a good anchorage south of the largest island in the northeast corner of the bay. For better shelter, head northwest past the end of Long Point and thread through the islands and rocks into Long Point Cove. Carved out of the base of Long Point, it’s snug and pretty with rocky islets that deserve to be explored by dinghy. Tread lightly on the land and don’t pick any berries, as it is part of the Serpent River First Nation. Around the corner to the northeast is the former sawmill town of Spragge. A small cemetery and a couple of private homes are all that remains of a community that was home to as many as 300 people a century ago. The North Channel Yacht Club, a half-mile to the east, is a self-help club with 40 or 50 moorings, as well as docking for boats up to 65 feet long. Some moorings are available when seasonal members (mostly sailors) are away. Pump-outs are available, but no fuel. Turnbull’s well-protected main anchorage has a beach and the islets to the west are ideal for adventurous cruisers. About six miles to the west-southwest is the popular Turnbull Island group. Turnbull and Bassett islands are actually attached, with roughly a dozen small islands and islets spread in the mile-and-a-half west to Sanford Island. Turnbull’s well-protected main anchorage has a beach and the islets to the west are ideal for adventurous cruisers. If you head south through Turnbull’s anchorage, then west through the passage south of Sanford Island, be careful to avoid unmarked Cherub Rock and Huntley Reef. Back in open water, the town of Blind River is northwest across the Blind River Bank, which can be as shallow as nine feet. A sawdust burner and water tower – both relics of the town’s sawmill past – are Blind River’s prominent landmarks, along with a modern wind turbine. The Blind River Marine Park has 95 slips for seasonal and transient boaters up to 100 feet long. Reported depths are 10 feet at the service dock, and five-and-a-half feet at the slips. Gas, diesel and pump-outs are available. There’s usually plenty of room for visitors, who will find a large, well-equipped clubhouse with washrooms, showers, laundry, Internet service and a café. 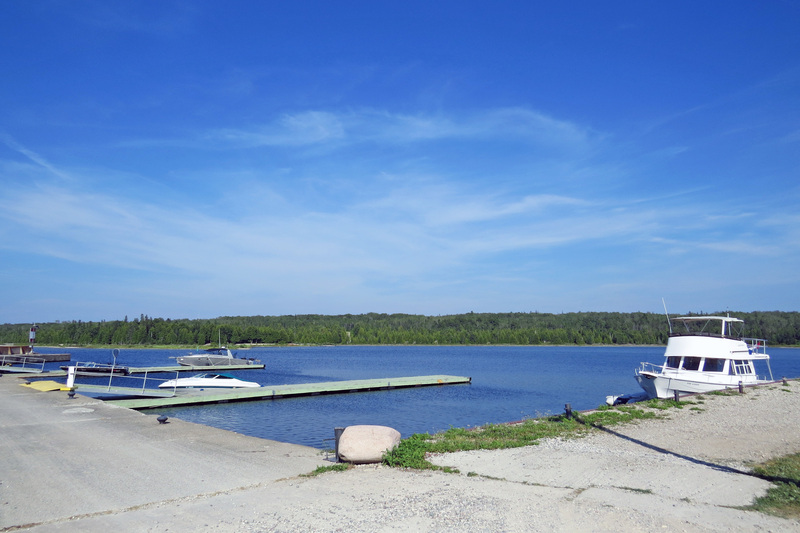 With a population of 3,900, Blind River is a major regional hub offering boaters stores, services and restaurants. 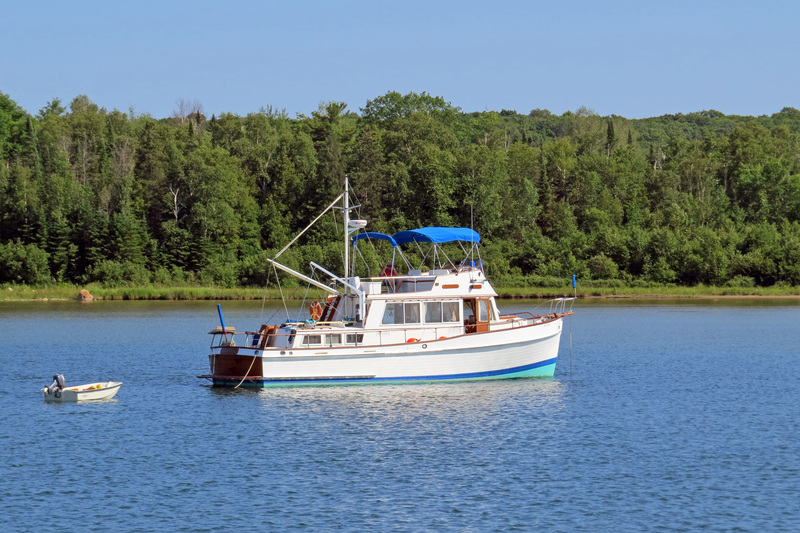 The 27-mile cruise from Blind River to Thessalon is the longest stretch of open water cruising as we head west to Thessalon Point. 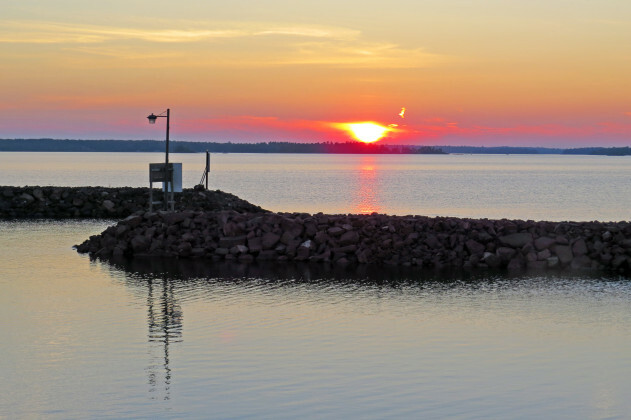 A lumbering and tourist town, Thessalon is a popular stopover for cruisers en route to Sault Ste. Marie and American boaters headed east. The Thessalon Municipal Marina has 60 slips, including about 25 for visitors, with shore power and water for boats up to 96 feet. There’s eight feet of water at the service dock and more at berths on the southern breakwall. Thessalon’s marina has park-like grounds, a boater’s centre with washrooms, showers, laundry, wireless Internet, a lounge and a kitchenette, plus ice, pump-out, gasoline and diesel sales. For supplies and restaurants, downtown Thessalon is easy to reach on foot or on the marina’s courtesy bicycles. It’s about 10 miles west to Bruce Mines, home of Canada’s first copper mine. When we visited in summer of 2013, there was enough water for our cruiser (drawing about four feet) to reach the fuel dock. Boats needing more depth should call ahead to check on current water levels. The marina has gasoline, diesel and pump-out, with 35 seasonal and transient slips. Cruisers heading to Sault Ste. Marie have two routes around St. Joseph Island. Boats that can’t get under the Twyning Island Bridge go south of the island then connect with the main shipping channel at Lime Island. We head northwest through the St. Joseph Channel and join the upbound lane of the main channel at Stribling Point. About 19 miles long and 12 miles wide, St. Joseph Island was settled in the late 1800s by Europeans who depended on lumber and farming. These days, it’s home to 1,800 people and tourism is the economic mainstay. Cruising boaters find modern, well-equipped marinas at Hilton Beach and Richards Landing. We stop at Moffat Bay, an anchorage off Big Point Park, then head to Hilton Beach and the Hilton Beach Marina. It has 165 serviced slips, with 30 for transients. There’s a launch ramp for trailer boaters, gasoline, diesel, pump-out and plenty of water depth. The marina also has wireless Internet, washrooms, showers and laundry facilities. It’s a short walk to the village of Hilton Beach, which has gift shops, a convenience store and a liquor outlet, as well as restaurants with views of the water from outdoor patios. Back on the St, Joseph Channel, Portlock Harbour is about two miles to the northeast. The area has many cottages but there are still a few good anchorages. Other popular local anchorages are northwest of Campement d’Ours Island, past Kensington Point Marina on the mainland behind Killaly Point. Dead Boy Cove, opposite Picture Island, is a small, deep, well-sheltered anchorage on Campement D’Ours Island. West and just south, there’s a popular local anchorage between Sapper and Picture islands, east of Whiskey Rock. Heading west, a range leads boats under the Twyning Island Bridge with 35 feet of clearance. Further west, Richards Landing has one of several classic white and red lighthouses on or near the island. Another prominent landmark, the steel and glass building that houses The Lighthouse Grill restaurant also has washrooms, showers, laundry and offices for the Richards Landing Municipal Marina. The marina has 72 serviced slips and sells gasoline, diesel and pump-out. There’s a launch ramp for trailer boaters and wireless Internet. And every evening the sun sets gloriously over the St. Joseph Channel. It’s a short walk to downtown Richards Landing, the largest village on St. Joseph Island and its commercial hub. It’s a good place to re-provision and do some shopping. The island’s hospital, post office and historic county jail are there too. Sandy Gardiner, a local marine contractor and pleasure boater, says the area’s water and landscape are a big part of its appeal. Departing Richards Landing, cruisers may be distracted by another scenic lighthouse on Shoal Island off Boulanger Point, but need to pay careful attention heading along the Canada-U.S. border to make sure to join the main shipping channel, south of Sugar Island, Mich. There’s a small craft channel through Lake George to Sault Ste. Marie, but it’s at least eight miles longer and visitors should check on depths with local boaters. The upbound shipping lane stretches about 11 miles to the Soo. It may be less scenic but is very well marked and offers plenty of depth. At Mission Point – with Sault Ste. Marie, Ont., ahead – watch for the ferry between Sault Ste Marie, Mich., and Sugar Island. Used by freighters, the U.S Sault locks are about a mile-and-a-half ahead on the south shore. Pleasure boaters will find the Canadian lock about a half mile further northwest, north of Whitefish Island. “Sault” is French for rapids. Good fishing on the rocky, fast-moving upper St. Marys River made the area a gathering place for Aboriginal Peoples. With a population of 74,000 today, Sault Ste Marie, Ont., is now home to the Essar Steel Algoma mill. On the U.S. shore, the Edison Sault Power Plant (built in 1902) is also a highly visible landmark. The first marina along the route north, Bellevue Marina is mainly for seasonal boaters. Operated by the city of Sault Ste. Marie, Bellevue has 151 slips with shore power for boats up to 40 feet long, along with a launch ramp, gasoline, diesel and pump-out. Roberta Bondar Marina, named in honour of Canada’s first female astronaut, is about a mile-and-a-half upriver. Also owned by the city, it’s reserved for visiting boaters. The Bondar marina is easy to identify with the white tent-roofed pavilion next door. The retired ferry, Norgoma – which may soon be removed from the marina – was also a visible landmark. The marina has 50 serviced slips and a seawall for yachts ranging up to 140 feet in length. There are washrooms, showers, laundry facilities and wireless Internet. Snacks, charts and boating supplies are available at the marina office. The Canadian Bushplane Heritage Centre is a must-see for anyone interested in Canadian northern aviation. One of the best attributes of this popular marina is its downtown location, with the city’s museums all within walking distance. The nearby Canadian Bushplane Heritage Centre is a must-see for anyone interested in Canadian northern aviation. It has almost two dozen airplanes on display – including a Canadair water bomber – in a building that once housed aircraft for Ontario’s provincial forestry service. The 1812 home of Sault Ste. Marie settler and fur trader Charles Oakes Ermatinger is across the street, while the Art Gallery of Algoma and city museum are not too far away. Cruisers staying at the Bondar marina are close to restaurants, including the Docks Riverfront Grill right next door. Although downtown is nearby, cruisers doing extensive provisioning should hire a taxi. There’s also a full range of shopping in the Station Mall. Pleasure boaters heading into Lake Superior can take the commercial-oriented U.S. locks, but the 1895-vintage Canadian lock is a historic site that has served recreational boat traffic only since being rebuilt in the late 1990s. It’s free, operates 9 a.m. to 9 p.m. during summer months, and raises boats 19 feet into Lake Superior. Four miles upriver, past the steel mill and a ship-breaking yard, pleasure boats gather at Pointe aux Pins. Six miles further along, you reach the open water of Whitefish Bay on the world’s largest freshwater lake. On the well-marked route south from Sault Ste Marie, we retrace our path in the St. Marys River shipping lanes in the company of freighters. We pass Round Island Light and Lime Island, follow along the Michigan mainland, past the village of DeTour, Mich., out the DeTour passage into the open water of Lake Huron. 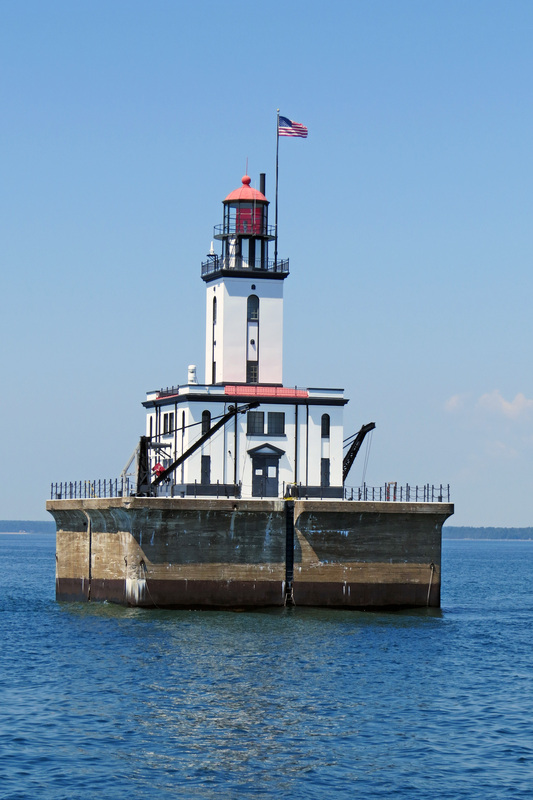 The DeTour Reef lighthouse, now operated by volunteers and open for visiting light keepers, is a welcome landmark for Lake Huron cruisers headed into the North Channel. Heading back north, Drummond Island, Mich., is to starboard. From here, there’s a well-marked route to the well-protected anchorage at Harbor Island. Unlike most islands in Potagannissing Bay, Harbor Island is a National Wildlife Refuge and has no cottages. It’s popular with local and visiting boaters and about a mile-and-a-half from Drummond Island’s main marina. 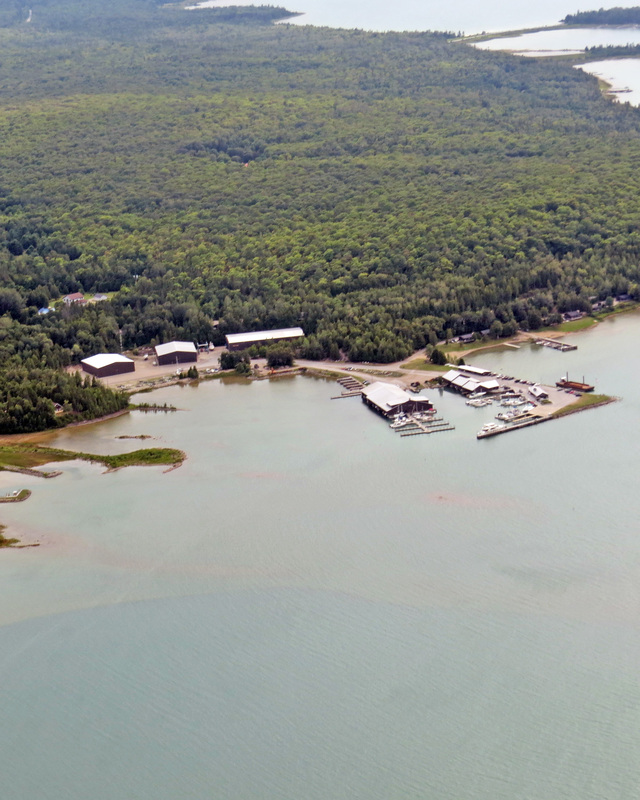 Drummond Island Yacht Haven is a well-protected basin with 90 covered and open slips for yachts up to 120 feet. Half are for visiting boaters, but reservations are a good idea. Depth in the basin is at least 10 feet and gasoline, diesel, propane and pump-out are available. There’s wireless Internet, showers, washrooms, laundry facilities and a well-stocked marine store. Yacht Haven can haul, repair, store or service boats of all types and sizes. There’s a launch ramp for trailer boaters and 32 waterfront rental cottages next door. Owner Denny Bailey grew up at the marina and continues to expand and improve it. Drummond Island has a population of 1,800 and a local dolomite quarry, but most of the economy is built around cottagers and tourists. The “downtown” is about two miles from the marina, with a supermarket, liquor, wine and beer sales, hardware and ice cream. 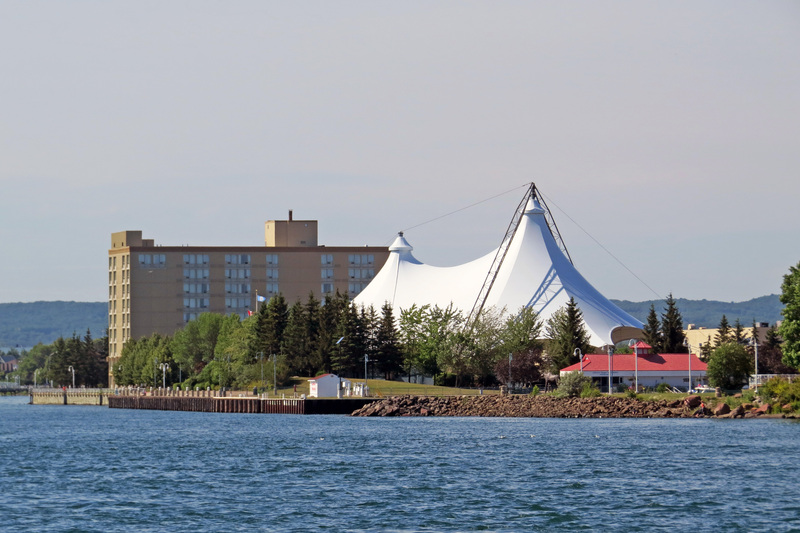 The Drummond Island Resort and Conference Center has accommodations, beaches, boating, dining, family entertainment and golf in one neat package, including bowling, an off-road vehicle park, tennis and fine waterfront dining at Bayside. To top it off, the resort is home to The Rock, an 18-hole championship golf course that comes complete with fearless local deer. The shortest route north from Drummond Island Yacht Haven to the North Channel is through a well-marked route past several islands. Instead, we head west and back into Canadian waters to check out Milford Haven, a narrow, well-protected cove in the southeast corner of St. Joseph Island and a popular stop for cruisers. Just remember to check in with Canadian authorities before stopping overnight or landing anywhere in Canada after returning from Drummond Island. From the southeast end of St. Joseph Island, it’s 23 miles east, then southeast across the top of False Detour Channel, to Tolsmaville on Cockburn Island. The harbour has floating docks and seawalls that can accommodate boats up to about 50 feet in six to 10 feet of water. Siberon Falcott Tolsma initially developed the village as a commercial fishing base in the late 1800s. Much of the island was soon settled and cleared for farming. Established as a municipality in 1881, it was once home to hundreds of people. These days, it has only one year-round resident, the municipal maintenance foreman, but dozens of summer residents maintain homes on the former town site or hunting camps nearby. There are no services or supplies, so visiting boaters must bring their own fuel and provisions. 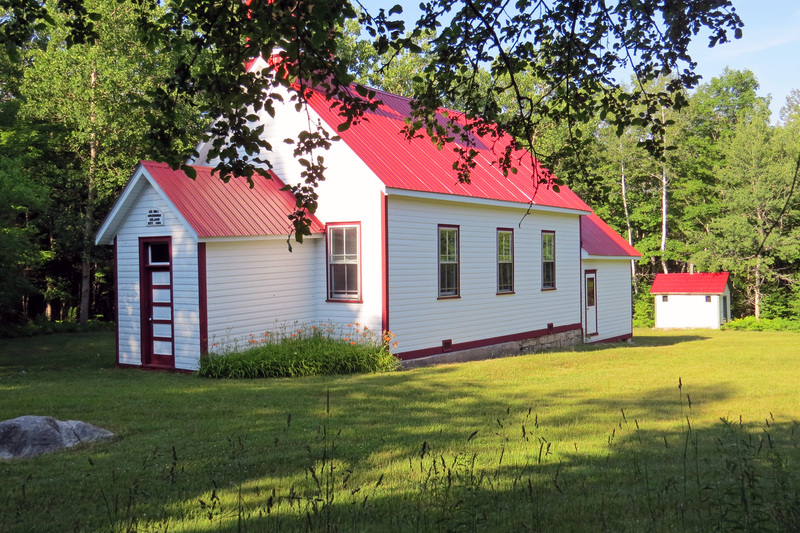 The island has a restored 19th century schoolhouse that was closed in 1955, plus a community church, town hall and fire station. There are 50 miles of roads and a local fleet of aging vehicles. The Huron Timber Company recently agreed to sell about half of the island to the Nature Conservancy of Canada, so it will remain largely in a natural state. It’s a unique and usually quiet destination. It is about 12 miles further east to Meldrum Bay, the westernmost community on Manitoulin Island and a Canada Border Services check-in point. The village marina is protected by a breakwall to the north, with 40 slips for boats up to 80 feet on floating docks and a seawall. The service dock, with gasoline, diesel and pump-out, has 18 feet of water and at least 20 serviced slips for visiting boaters. There are washrooms, showers, laundry and a launch ramp. the main attraction for many cruisers is the historic Meldrum Bay Inn. Meldrum Bay has its own LCBO outlet, a small general store, a fishing-oriented museum, along with campgrounds and cabins. But the main attraction for many cruisers is the historic Meldrum Bay Inn. Built in 1878, it’s been carefully and tastefully restored, with verandas where guests can relax and watch the harbour. The Inn’s real drawing card, though, is its licensed dining room, which keeps many cruisers coming back. Vidal Bay, east of Meldrum Bay and south of Vidal Island, is a spacious anchorage with good protection from north winds. 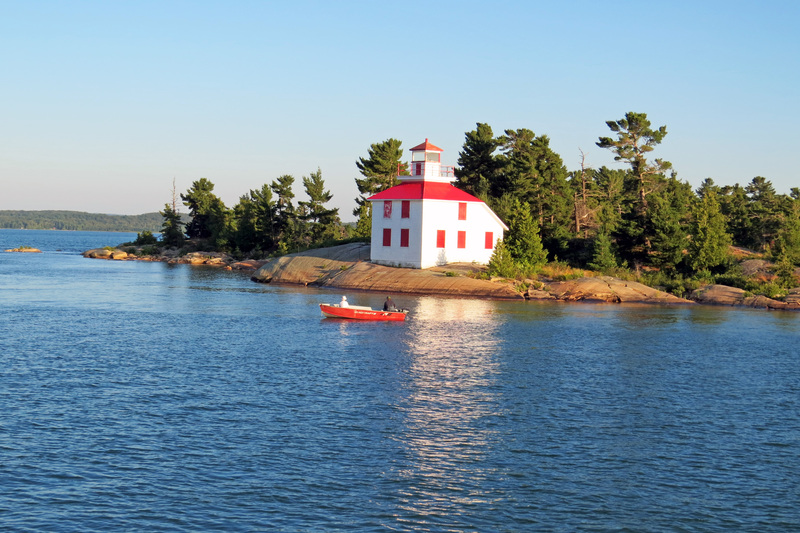 From here, it’s 22 miles east to Janet Head lighthouse at the western entrance to Gore Bay. For cruisers heading east, en route to homeport, it’s another 24 miles to Little Current or 43 miles to Killarney. The North Channel’s wilderness anchorages and friendly ports, though, are sure to bring them back. The spectacular scenery may not change, but every visit is a chance to experience it in a new way.